The president's oldest son will increase appearances behalf of GOP candidates as Election Day nears, an aide tells NBC News. 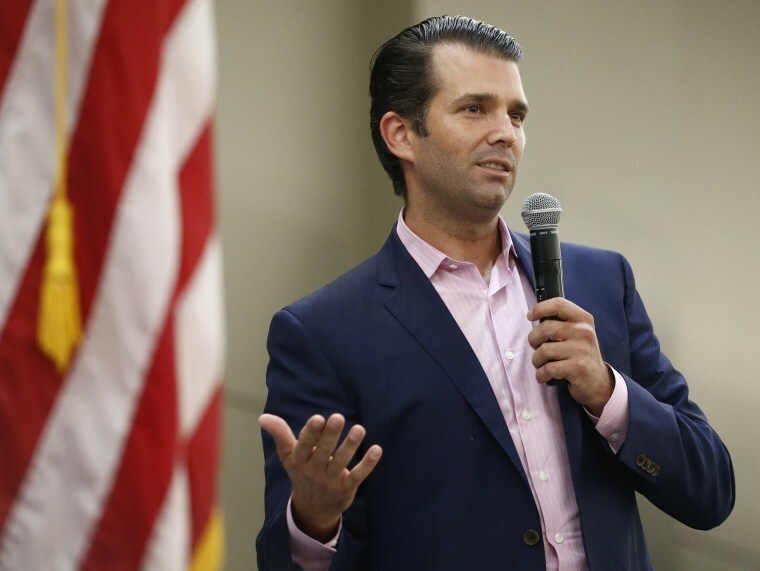 CONROE, Texas — By the time Donald Trump Jr took the stage here Wednesday night, he had already done four events in support of Republican Sen. Ted Cruz’s closely watched re-election bid. He’s putting in the work for Cruz, and other GOP candidates, but his cause is greater. For Trump Jr., every race is about the one man whose name isn't on a 2018 ballot: His father, President Donald Trump. Voters, the president's oldest son told NBC News in an exclusive interview Wednesday night, "don’t know their congressman, they don’t have that same emotional connection that they do with my father." "But the reality is for them Trump is on the ticket in 2018," Trump Jr. said. Trump Jr.'s political calendar has filled in recent weeks with fundraisers and rallies across the country, and an aide to the president's son tells NBC News that the schedule will only ramp up as Election Day nears. He's campaigning around the country with former Fox News host and girlfriend Kimberly Guilfoyle. The reason for the busy schedule isn't because he fears what could happen to his father's presidency should Republicans lose control of Congress, he said. "It's the policies," Trump Jr. said. "You'll have a stalemate. You think the mess in Washington has been bad the last two weeks? It will be so much worse because they are not just trying to do it a little bit differently. They wanna reverse everything." By "they," Trump Jr. means members of the Democratic Party — a near-constant punching bag of his father's from the nation's largest bully pulpit, and of his, too, during increasingly frequent appearances on the trail. He told NBC News that voters don't care about his entanglement in special counsel Robert Mueller's Russia probe, calling it "nonsense." When he's rallying the crowds, he takes on any number of perceived enemies, railing at Democrats, party politics and anyone who has ever naysayed his father's plans for the country and his ability to get things done. For GOP candidates — at least ones trying to hew as closely to the president as possible — who better to pump up their Trump bonafides than, well, a Trump? "It's fabulous to have so much support from the White House," GOP Senate hopeful Matt Rosendale told NBC News after a Bozeman, Montana rally with Trump Jr. "He brings energy to the entire state...This is energy. This is a riled up, charged up Republican Party." The eldest Trump kid has trained his sights, for the most part, on key Senate races where Republicans hope to pick off vulnerable Democrats who find themselves on defense in states that Trump won in 2016, like West Virginia, North Dakota, and Montana. But he's also rallied for Republican gubernatorial hopefuls — like Ron DeSantis in Florida — and he'll be with Georgia governor Brian Kemp next week. Trump Jr. made it clear that he's pounding the pavement — or rather, the rally-and-fundraiser-circuit — for friends of the Trump name and agenda only. "I'm here to help the people that we’ve had good relationships with," he said moments before stepping in front of the huge pro-Cruz crowd Wednesday night. "We’re out there fighting for the people who have been there and supported my father." The packed house of red "Make America Great Again" hats and Cruz t-shirts at the Lone Star Convention & Expo Center Wednesday night is a scene some political watchers might have found hard to believe, given the heat of the 2016 presidential campaign and the once-bitter rivalry between Cruz and the president. But it makes perfect sense at the height of a midterm election cycle that has Democrats hoping for a "blue wave" and Republicans looking to the loyal Trump base to help boost turn out. For those voters, Trump Jr. provides a physical reminder of what's at stake. "Anything Trump does, I am for it," Elmo Wilson told NBC News in Conroe — and that goes for Trump's son, as well. Others, like Eddie Williams, who recalls the president's visit after Hurricane Harvey hit the state, says Trump Jr.'s coming to Texas "shows Texas again just how much his family appreciates Texas and likes Texas." Voters, Trump Jr. said, might be ready for Trump 2020, but he'll be on the trail to remind them that they can't get complacent in the midterms. Will his ever be the Trump name on the ballot? "You never know. I’m never gonna rule anything out. Right now I’m just having fun," he said.